Name Variation Wilhelm C. F. Rehborg was also known as W. C. F.
Name Variation Wilhelm C. F. Rehborg was also known as Vilhelm. Wilhelm C. F. Rehborg married Elizabeth Meaker. Wilhelm C. F. Rehborg was born circa 1870 at Illinois. Henry W. Rehborg married Karoline Smith. Henry W. Rehborg was born circa 1872 at Illinois. Carl C. Rehborg married Lena Noerenberg, daughter of Christ Noerenberg and Augusta Fandrey. Carl C. Rehborg was born circa May 1880 at Illinois. Name Variation Lena Noerenberg was also known as Line. Name Variation Lena Noerenberg was also known as Nockrenberg. Lena Noerenberg married Carl C. Rehborg, son of Henrich Rehborg and Dorothy Oldendorf. Lena Noerenberg was born in July 1882 at Illinois. She was the daughter of Christ Noerenberg and Augusta Fandrey. [S245] U.S. Federal Census 1900 U.S. Federal Census, by Ancestry.com, Year: 1900; Census Place: Ash Grove, Iroquois, Illinois; Roll T623_307; Page: 8B; Enumeration District: 2. Albert Rehborg was born circa 1908. He was the son of Carl C. Rehborg and Lena Noerenberg. Lydia Rehborg was born circa 1906. She was the daughter of Carl C. Rehborg and Lena Noerenberg. Karoline Smith married Henry W. Rehborg, son of Henrich Rehborg and Dorothy Oldendorf. Fred Rehborg married Helen Burley, daughter of Adelbert Burley and Agnes Campbell. Fred Rehborg was born circa 1902. He was the son of Henry W. Rehborg and Karoline Smith. Helen Burley married Fred Rehborg, son of Henry W. Rehborg and Karoline Smith. Helen Burley was born circa 1901. She was the daughter of Adelbert Burley and Agnes Campbell. Adelbert Burley married Agnes Campbell. Married Name Her married name was Burley. Agnes Campbell married Adelbert Burley. Elizabeth Meaker married Wilhelm C. F. Rehborg, son of Henrich Rehborg and Dorothy Oldendorf. Maria Rehborg was born circa 1912. She was the daughter of Wilhelm C. F. Rehborg and Elizabeth Meaker. William Rehborg was born circa 1904. He was the son of Wilhelm C. F. Rehborg and Elizabeth Meaker. Married Name 17 January 1942 As of 17 January 1942,her married name was Klemme. Lois LaVerna Swift was born on 11 July 1920. She married Leonard Fredrick Klemme, son of Frederick Klemme and Etta Margaret Tapper, on 17 January 1942. Lois LaVerna Swift died on 8 June 1984 at age 63 Services were held at 1:30 p.m. Monday, June 11 at Immanuel Lutheran church in Akron. The Rev. Benard Nelson officiated. Carol Harris was organist and Jim Henriksen, soloist. Burial was in Riverside cemetery in Akron under the direction of the Schroeder funeral home. A prayer service and an Eastern Star service conducted by Vesper Chapter 61 were held Sunday evening at the funeral home. Pallbearers were Lawrence Maynard, John Dirks; Larry Swift, Tom Miller, Viggo Henriksen, Tom Ross, Jim Miller, Scott Swift, and Bob Swift. Mrs. Klemme, the former Lois LaVerna Swift, was born July 11, 1920 to LuVern and Selma Nelson Swift in Akron. She graduated in 1938 from Akron high school, where she excelled in sports. She played on the Akron high school girls' basketball team as a guard, and went to the state basketball, tournament twice with the local winning team. Lois, known as "Lefty" pitched for a softball team from the time she was in junior high, and was highly respected by her team mates and opponents. She married Leonard Klemme, January 18, 1942 at Akron. They farmed for many years in the Akron area moving to Akron in 1962 when they opened the Akron Bowl, which they operated until 1976. The couple were co-owners of the Town and Country Hardware store in Akron from 1977 to 1980. Lois was an exceptional bowler and golfer enjoying these activities even through the past year. She will be remembered by her family and friends as a very special person, and a loving, caring wife, mother and grandmother. She was a member and past worthy matron of OES chapter 61; member of the American Legion auxiliary; Rural Home Culture club; Akron Bowling association; and Ladies Golf association. She served on the Akron Community school board of directors, being the first woman elected to this position. She was a member of Immanuel Lutheran church and LCW. Survivors include her husband, Leonard; one daughter, Judy Lynn Davis and one son, Gay nor Swift Klemme, both of St. Louis, Mo; one sister, Genevieve Earner of Washington, D.C; two brothers, Burton "Lefty" Swift of Akron, and Hugh "Barney" Swift of Tombstone, Ariz; two grandchildren; and many nieces and nephews. She was preceded in death by her parents and one brother, Charles. Name Variation Alwayne Edith Delaney was also known as Galvin. Married Name 30 December 1942 As of 30 December 1942,her married name was Blaue. Married Name 5 September 1987 As of 5 September 1987,her married name was Klemme. Alwayne Edith Delaney was born on 5 September 1919. She married Erv Blaue on 30 December 1942. Alwayne Edith Delaney married Leonard Fredrick Klemme, son of Frederick Klemme and Etta Margaret Tapper, on 5 September 1987. Alwayne Edith Delaney died on 29 April 2012 at age 92 Alwayne Klemme, 92, of Le Mars passed away unexpectedly, Sunday, April 29, 2012 at her home in Le Mars. Funeral services will be 10:30 a.m. Thursday, May 3, 2012 at the Carlsen Funeral Home in Le Mars with Reverend John Battern of the Le Mars United Methodist Church officiating. Interment will be at Resthaven Memory Gardens Cemetery. Visitation with the family present will be after 5:00 p.m. Wednesday, May 2, 2012 at the Carlsen Funeral Home in Le Mars with a 7:00 p.m. Prayer Service. Expressions of sympathy can be extended to the family through www.carlsenfuneralhome.com. Alwayne Edith Delaney was born September 5, 1919 on the family farm in Stanton Township, rural Plymouth County, Iowa to Martin and Anna (Ahlrichs) Delaney. Alwyne attended country school near her home. She was united in marriage to Erv Blaue on December 30, 1942 in Elk Point, South Dakota. Together they operated Blaue''s DX station from 1942 until 1960. Erv passed away on April 21, 1963. Alwayne had later worked at Zeneith Corporation in Sioux City for a number of years. In 1970, Alwayne started to spend her winters in California and returned to Iowa in the summer. On September 1987, Alwayne was united in marriage to Leonard Klemme. Together they enjoyed spending the winters in California, Arizona and Nevada. Leonard passed away on October 28, 2006. Alwayne was a member of the Le Mars United Methodist Church and the United Methodist Women. She enjoyed traveling, golfing, bowling, and visiting with family and friends. Survivors include her 5 sisters: LaVonne Brouillette and her husband Errol of Salix, IA, Charlene Boyle of Le Mars, Katheryn Tapp of San Jose, CA, Esther Auck and her husband Bernie of Riverside, CA, and Thelma Coats of Tulsa, OK; 2 sisters-in-law, Mary (Lynn) Greimann of Phoenix, AZ and Connie Delaney of Iowa City, IA; and several nieces and nephews. She was preceded in death by her parents and her husbands. Ken Ridgeway died before November 2006. Claus John Kruse was born on 26 January 1911. He married Irene Wilhemine Anna Klemme, daughter of Frederick Klemme and Etta Margaret Tapper, on 14 June 1959 Irene (Klemme) Popken and Claus Kruse marriage announcement. SPOUSE & DATE of 1st MARRIAGE: Doretta Westhoff, Nov. 29, 1934; The couple made their home on the Kruse family farm. His wife died July 18, 1957. 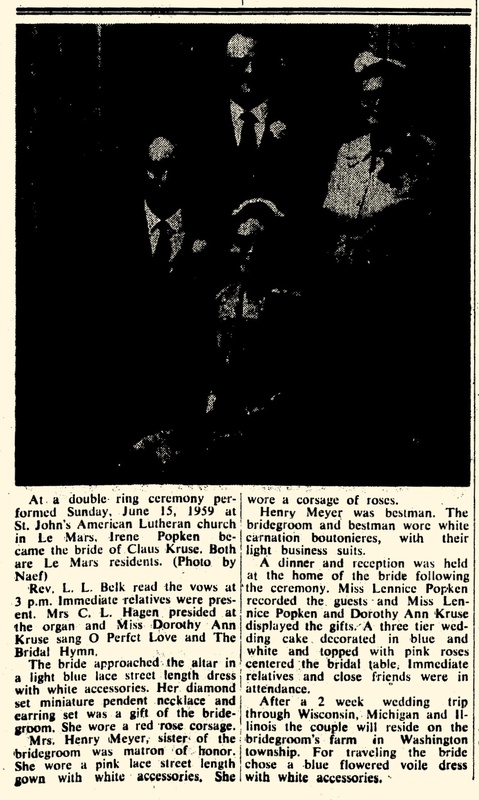 SPOUSE & DATE of 2nd MARRIAGE: Irene Popken, June 14, 1959. The couple made their home on the Kruse Century farm until moving into LeMars in October 1999. SURVIVORS: include his wife; two daughters and their husbands, Dorothy Ann and Fred Goettsch of Sioux City and Lennice and Don Farnham of Hillsboro, Ore; a son and his wife, Duane and Sharon Popken of LeMars; eight grandchildren; six great-grandchildren; and a sister, Clara Meyer. PRECEDED in DEATH by: an infant brother, Harm; a brother, Harm; and infant sister, Antja; and a sister, Anke Margaret Jelken. He was buried after 13 March 2001 at Saint Johns Cemetery, Craig, Plymouth, Iowa. Claus John Kruse obtained US Social Security Card at Iowa; last residence Le Mars, Plymouth, Iowa. Name Variation Bernard Arthur Klemme was also known as Benny. Bernard Arthur Klemme was born on 11 October 1914. 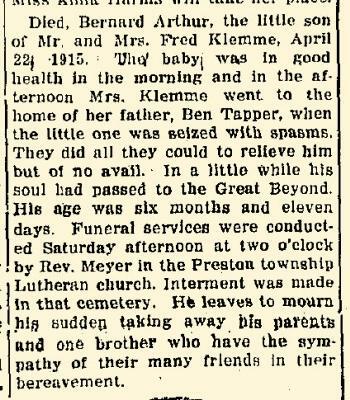 Bernard Arthur Klemme died on 22 April 1915 at age 6 months, 11 days, Bernard Arthur Klemme obituary. Name Variation Bernard H. Marienau was also known as Ben. Married Name Her married name was Marienau. Ida Berg married Bernard H. Marienau. Robert Marienau was born on 24 June 1935. He was the son of Bernard H. Marienau and Ida Berg. Robert Marienau died on 10 May 2005 at age 69 Robert Marienau, 69, of San Bernadino, Calif., and formerly of Le Mars, died Tuesday, May 10, 2005, in San Bernadino, Calif.
Robert was born June 24, 1935, in McNally in Sioux County, the son of Bernard and Ida (Berg) Marienau. He was baptized and confirmed in the Lutheran faith. He attended school in Brunsville. He was drafted in the U.S. Army and served in the Korean Conflict. 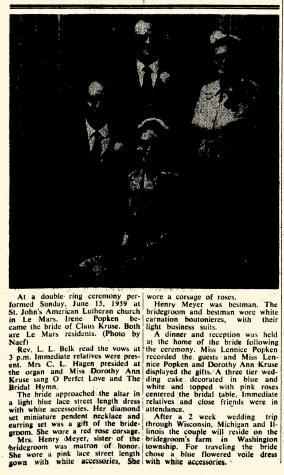 On March 15, 1961, he married Mary Lou Recker. Survivors include two sons, Brian of Kansas City, Mo., and Blaine and his wife, Carolyn, of Sioux City; a daughter, Rebecca and her husband, Jeffrey Mason of North Sioux City, S.D; two brothers, Norman and his wife, Neva, of Hawarden and Leonard and his wife, Eleanor of Ireton; two sisters, Eileen Vander Helm of Hawarden and Lorraine and her husband, Donald Luksan, of Le Mars; five grandchildren, Amanda and Brittany Barley, Jason Marienau, Cassandra and Ashley Mason; and many nephews and nieces. 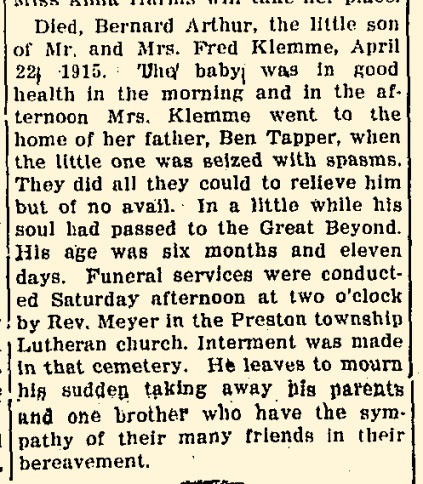 He was preceded in death by his parents; one brother and sister-in-law, Marvin and Elverna Marienau; two sisters, Ida Mae Marienau and Evelyn (Klemme) Gronemeyer; three brothers-in-law, Norman Klemme, Glenn Gronemeyer and Henry Vander Helm; one nephew, Marvin Vande Hoef and one great-nephew, Chris Walrod. A memorial service was held at St. Paul's Lutheran Church in Ireton for the family. Burial was in the Department of Veterans Affairs Riverside National cemetery in Riverside, Calif.
Henry Vander Helm died before June 2005. Marvin Marienau was the son of Bernard H. Marienau and Ida Berg. Marvin Marienau married Elverna (?). Marvin Marienau died before June 2005. Elverna (?) married Marvin Marienau, son of Bernard H. Marienau and Ida Berg. Elverna (?) died before June 2005. Ida Marie Marienau was the daughter of Bernard H. Marienau and Ida Berg. Ida Marie Marienau died before June 2005. Mary Elizabeth VanNatta was born on 21 October 1893 at Dubuque, Dubuque, Iowa. She was the daughter of George Roscoe VanNatta and Mary Ann Wiedman. Mary Elizabeth VanNatta died on 2 February 1962 at age 68. 1895 Fifth Ward Dubuque, Dubuque, Iowa Mary Elizabeth VanNatta appeared on the census of 1895 in the household of George Roscoe VanNatta at Fifth Ward Dubuque, Dubuque, Iowa. Laura VanNatta was born in 1891 at Dubuque, Dubuque, Iowa. Michael Schneider was born circa 1878 at Wisconsin. He was the son of Paul Schneider and Mary Maring. 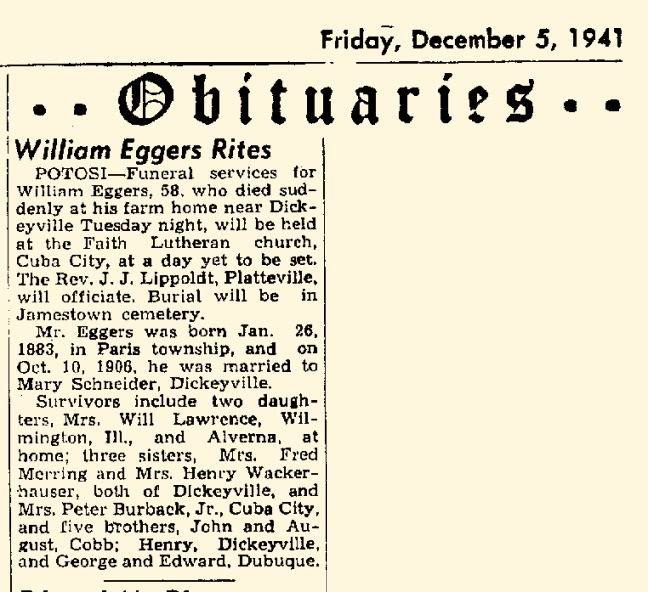 William Eggers was born on 26 January 1883 at Paris, Grant, Wisconsin. He married Mary Schneider, daughter of Paul Schneider and Mary Maring, on 10 October 1906. 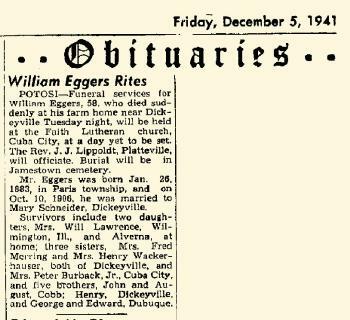 William Eggers died in December 1941 at age 58 William Eggers obituary.